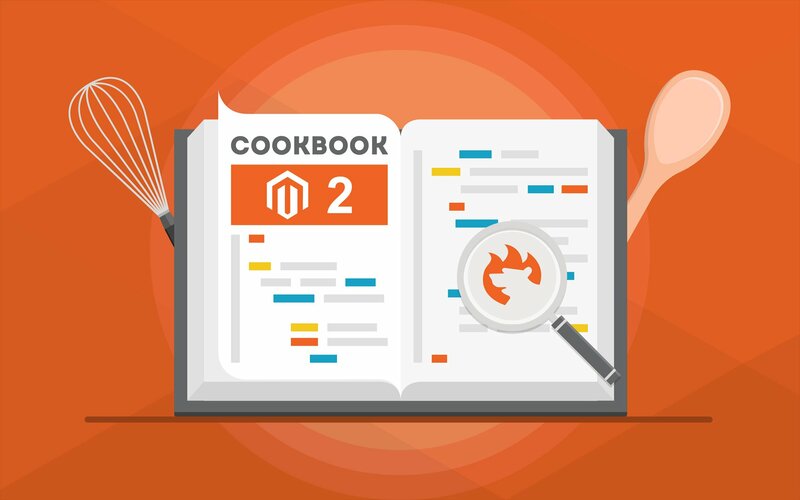 It is not a secret that Magento 2 Commerce/Cloud edition import and export procedures can be automated and offer an enhanced functionality compared to Magento 2 Open Source (Community) edition. Still, there is some functionality lacking. In this post, we have gathered the suggestions on how to improve Magento 2 Commerce/Cloud import and export, how to import XML and Json file, import categories and other entities. Magento 2 Commerce/Cloud in comparison with Open Source (ex. Community) version comes with improved Import and Export procedures. The main difference with Open Source comes from the possibility to schedule the import and export. Let’s break down the process and look at the features available. The scheduled import and export can be found under System > Data Transfer. First screen you get on is the Scheduled Imports/Exports grid. Here you can add new imports and export, or manage existing ones. Let’s click ‘Add Scheduled Import’ button to see how it works. The export comes with the same settings. Compared to Magento 2 Open Source we get additional entity ‘Customer Finances’. This entity has been added because Magento 2 Commerce allows customers to use store credit and reward points. In Customer Finance file you can find such fields as store_credit and reward_points. In this fields you can specify store credit and reward point balance of a particular customer respectively. Add/Update – entities from the file will be either added to the store or updated if already exist. Replace – entities from the file will replace relevant existing entities at the store. Delete – entities in the file will be deleted from the store. Once you are done with this settings scroll down for scheduling the import. Here you decide on the import start time, and how often you want to repeat this procedure. The frequency can be set to: daily, weekly, monthly. Later in this post we will discuss Improved Import and Export extension which allows you to use advanced schedule and set any time and any intervals based of your requirements. Next, you are suggested to specify the field and multiple value separators, in case your CSV file uses different from the required by Magento 2. With Improved Import and Export you can also import XML and Json file types and import CSV files directly from Google Sheets. When done with mapping the file you proceed to the Import File Information configuration section. Here you decide whether you want to import a file from the local server or remote FTP. The choices are pretty limited compared to Improved Import and Export extension for Magento 2 by FireBear. With the help of the extension you can import any Magento 2 entity from Google Sheets, FTP/SFTP, Dropbox, direct URL or file. Next come Import Failed Emails. These emails can be sent to the store administrators in case errors happened during import or export processes. Magento 2 unfortunately doesn’t offer import and export run logs, so you cannot find any information on the process success and errors except in these emails. Improved Import and Export extension enables import and export loggins. Once the process is over the extension stores the progress log where you can find all the fields imported from the table and refer to the errors if any. That’s pretty much it for Magento 2 Commerce/Cloud scheduled import. The only thing left to do is hit ‘Save’ button. The import process will run automatically according to the set schedule. There are several ways of improving Magento 2 Commerce/Cloud import procedure. Most of the top quality variants involve use of the third party applications that you need to run manually from your desktop. However, here we will talk about Improved Import and Export extension for Magento 2. The extension has been developed and is supported by FireBear Studio. The extension provides the store owner with possibility to schedule import and export procedures to any time and interval required with the help of built-in cron scheduler. It allows importing almost any Magento 2 entity from different sources. Supports XML and Json file formats. And provides powerful attribute and category mapping capabilities. Let’s break down the import procedure using Improved Import and Export extension for Magento 2. Improved Import and Export extension operates in ‘Jobs’. That’s how to the automated import and export processes are called. The term comes from the functionality, as it covers every possible setting the store owner may need: scheduling, imported entity, behavior etc. 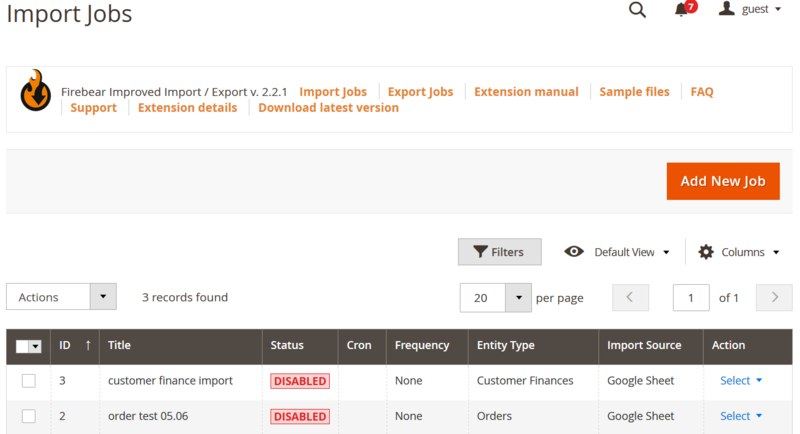 Both import and export jobs can be found under System > Improved Import/Export section of the administrator panel. Here you create and manage all the import jobs. For the export jobs, you get a similar screen with the same management tools. In the grid, you get the explicit information on the jobs you have and can edit the jobs directly from the gird. To create a new job click ‘Add New Job’ button. When you first get to the import job settings you see general settings section. Here you are suggested to name the job and schedule it. Pay attention how the scheduling works. FireBear team integrated cron scheduler into the Magento 2 administrator panel. 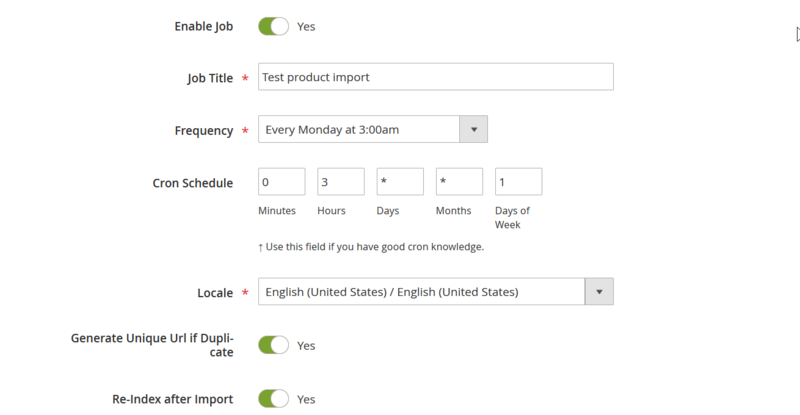 Using the cron scheduler you can create any recurring patterns and specify exact days you want the job to run on. It is a great deal compared to native Magento 2 scheduler. In addition to the general settings, you can decide if you need to re-index the catalog after the import completion. This can save you a lot of time, as some of the stores can run just fine without reindexing the catalog. Moreover, you get to specify whether the extension should handle URL duplicates for you. For example, if you not sure that all the imported product links are unique. Below the General Settings, you can find Import Settings section. More to it, you can now import tier prices along with the products, in a single file. If you are interested – read the dedicated blog article on Advanced Pricing import. Follow up next is the import behavior. This section is similar to the native Magento 2 one. However, you can also specify the separators used for categories. These separators come useful when you are working with suppliers that provide you with custom-formatted CSV tables. This section holds great differences and enhancements over native Magento 2 Commerce/Cloud import procedure. If with CSV everything is clear, we need to talk about XML and Json. XML files can be imported to Magento 2 Commerce/Cloud, and can be of any format. This become achievable with XSLT transformation templates that can be included right into the import jobs. For more information – read a dedicated blog article on XML file import. Json files can also be imported to Magento 2 Commerce/Cloud. This is a first step to integrating Improved Import and Export extension via Rest API with any management software you might be running. CRM systems, POS or ERP, you name it, – FireBear Studio is working on providing the store owners with full integration. The Google Sheets import makes it much easier for you to work with your colleagues or a supplier on the CSV tables you about to import. To understand how the Google Sheets import works – read a dedicated blog article on Magento 2 Google Sheets import. We have also composed a Google Sheet Master Table for you to get into Magento 2 import quick. The table comes with the description and sample values for every entity attribute. When you are done specifying the file type and import source click ‘Validate file’ button. Now, once you selected the entity you may want to map its attributes. For example: your supplier doesn’t know which attributes you use at your Magento 2 store, or you are migrating from another store. In this case you can take full advantage of the attribute mapping. In this section, you select the system attribute – an attribute that you use in your Magento 2, and specify the attribute from the file you are importing. The extension will handle the rest. During the import process, the values of an attribute from the file will be added to as values of the selected system attribute. If you are migrating from Magento 1 or Shopify – you can also select the attribute mapping presets. This will automatically fill the mapping table for you, and you will only need to run a job. In addition to attribute mapping, when importing products you can also map product categories. The extension allows you to upload categories from the imported file and specify the end category paths the products should have after the import process is complete. If you want to update the product prices during import it is also possible. The extension allows you to specify either a percent or fixed value to be added to the price of the products from the imported file. You can also take advantage of the conditions if not all products from the imported file should have their price updated. Improved Import and Export allows assigning simple products to configurables in several patterns. 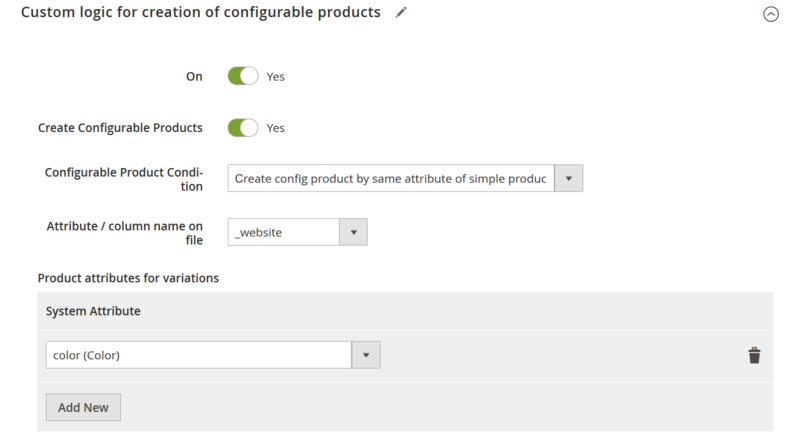 If you are adding new configurable products to your Magento 2 Commerce/Cloud catalog you may find it difficult to use native Magento 2 configurable product building pattern. With Improved Import and Export extension to get to choose the scenario on which simple products can be assigned to their parent configurables. We will omit the available patterns in this blog post. However, if you want to read more about it – check out the Improved Import and Export extension manual. That’s it. The only thing you are left to do now is to import the selected entity to your Magento 2 store. To do this click ‘Save & Run’ button in the upper right corner of the screen. The job will be executed and you will see the job progress. 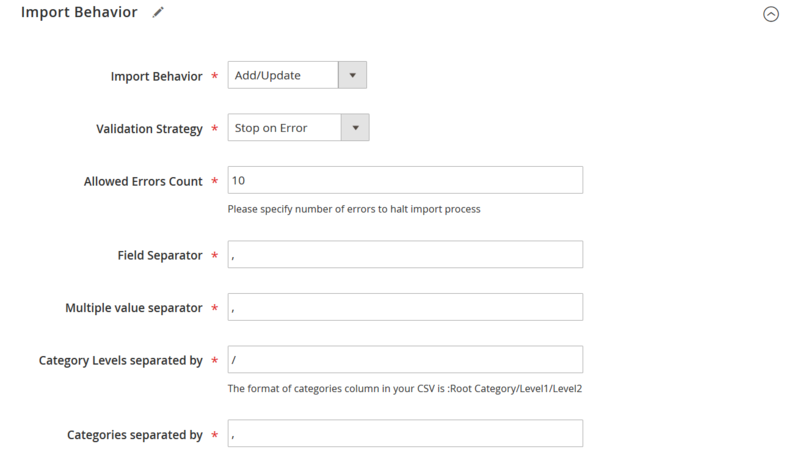 After the entity is imported to your Magento 2 store you will get access to the job log where you can see if any errors and if the job has been successful. The extension stores log for every job run so you can access them at any time to learn what has been imported. To have a better look at the extension let’s build a table to compare Magento 2 Commerce/Cloud features with the Improved Import and Export extension. This is the list with the main differences offered by the Improved Import and Export extension. Of course, there are multiple differences including UI and workflow. The full Magento 2 improved import-export processes are described in the Improved Import and Export extension manual. If you are new to Magento 2 import and export procedures we have composed a Magento 2 Import/Export Guide list for you. There you can find articles on how to import different entities to Magento 2 and how to prepare import tables. We’ve prepared a bunch of new improvements to the standard Magento 2 Commerce and Cloud import and export procedures. The default tools are very limited even if you use the Commerce version of the platform. Luckily, the Firebear team is always willing to help you. The latest Magento 2 Commerce release contains lots of new opportunities when it comes to user experience, but none of them can be imported/exported to another website. Luckily, it is possible to enable the missing functionality with the Improved Import & Export Magento 2 extension. So, what are the new features, and how does our module help with their import and export? The first vital improvement of 2.3 is shared catalogs. This feature allows you to implement an individual approach to every customer. Of course, it is a B2B functionality first. The key goal of the Magento 2 Commerce Shared Catalogs is the ability to provide your customers with individual catalogs. The improvement divides catalogs into two types: Public and Custom. Public catalogs are visible for everyone. Custom ones – to specific companies and clients. Thus, if you want to provide a selected partner with a specific offer, nobody else will know that. Magento 2 Commerce shared catalogs are a B2B feature which is especially useful if you want to share a discount with one of your partners while others should not know about it. And while Magento doesn’t let you import and export shared catalogs, you can always rely on the Improved Import & Export Magento 2 extension. Our module will help you transfer shared catalogs and all related data within just a few clicks. Follow the link above for further information about the Magento 2 Commerce shared catalogs import and export. Two useful B2B features introduced in Magento 2 Commerce are companies and negotiation quotes. The former lets you enable company accounts – complex customer accounts that consists of multiple individual ones. Each company account can be customized in terms of structure and provided information. As for Magento 2 Commerce negotiation quotes, they let your partners set up negotiable prices in the shopping cart. Next, your admins get a notification and can respond to the proposal. When the price is agreed, a customer can proceed to the checkout. Price, quantity, and other parameters of the negotiated order cannot be changed during this stage. Unfortunately, Magento 2 doesn’t let you import or export neither companies nor negotiation quotes. 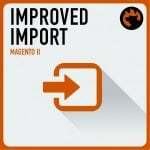 But you can always rely on the Improved Import & Export Magento 2 module. Our extension will help you transfer all the related data within just a few clicks. Follow the link above for further information about the Magento 2 Commerce shared catalogs import and export. You no longer need a team of specialists to create stunning and engaging store pages. Magento 2 Commerce offers a powerful page builder associated with an extended flexibility regarding the modification of multiple content types from product pages to blog articles. You must admit that Page Builder offers lots of robust improvements to the functionality of Magento 2. But, like in the previous cases, it is not possible to import/export the related data with the help of the default Magento 2 tools. Luckily, there is the Improved Import & Export Magento 2 extension that always changes the situation. Use our module to import/export Magento 2 Commerce Page Builder data. Follow the link above for further information. Imagine enhanced wishlists that do not disappear when a customer turns them into a new order. Wishlists that are optimized for multiple products and various views. Wishlists that dramatically reduce the complexity of buying frequently-purchased items. Meet Magento 2 Commerce Requisition Lists. This exclusive feature dramatically simplifies the shopping experience provided by Magento. It’s like recurring payments but with an advanced control level. Yes, such purchases are not entirely automated, but your customers have a list of what they want to buy on a regular basis. Instead of browsing through your catalog, these items can be added to a shopping cart within just a few clicks. That’s how Magento 2 Commerce requisition lists work. But since we face multiple limitations when it comes to the default import and export tools of Magento 2, requisition lists are not an exception. Unluckily, you cannot transfer this type of content and all the related data using the standard instruments. But the Improved Import & Export Magento 2 module eliminates the limitation. Our module lets you import and export Magento 2 Commerce Requisition Lists and all the related data. Follow the link above for further information. With Magento 2 Commerce Visual Merchandiser, you get a set of tools for product management. The goal of this feature is to enable you to position products and apply various conditions to them adjusting the structure of a category listing. You get a grid with all products, which can be dragged and dropped. Thus, you change their position in a very intuitive manner. Alternatively, it is still possible to work from a list of products in the category. The Magento 2 Commerce Visual Merchandiser offers a drag and drop functionality for changing the position of items. In addition to it, you can also set a position value. Follow the link above for further information about both features. As for import/export, the situation is the same, so you need the Improved Import & Export Magento 2 module to import and export Magento 2 Commerce Visual Merchandiser data. Follow the link above for further information. And it is no longer necessary to use third-party gift cards if your e-commerce store is based on Magento Commerce. The platform offers the desired functionality out of the box. Now, two gift card types are under your disposal. Firstly, you can sell virtual copies so that buyers can send them straight to an email address of a recipient. Secondly, it is possible to offer physical gift cards. You will need to pack them and go to a post office like in case of an ordinary order. Both customers and store administrators have various instruments of control over gift cards. For further information, follow the link above. And don’t forget that Magento doesn’t let you import and export gift cards, so you should rely on the Improved Import & Export Magento 2 module. With its help, you will easily transfer gift cards and all related data within just a few clicks. It is also worth mentioning that now you can create schedules for various storefront improvements. Meet the Magento 2 Commerce Content Staging functionality developed to simplify the way you create, preview, and schedule various content updates. The core principle behind Magento 2 Content Staging is the availability of two content types: an original version and a set of updates gathered in a campaign. When an update is expired, the original version is restored. As for the Magento 2 Commerce Content Staging data import/export, it is not possible with the help of the standard tools. But the Improved Import & Export Magento 2 module changes everything enabling the Magento 2 Commerce Content Staging data import and export. Follow the link above for further information. The Magento 2 Commerce store credit functionality is another feature we’d like to draw your attention to. You can provide your customers with credits out of the box – no third-party modules are required! Use them instead of refunds or to increase loyalty and sales. As a Magento administrator, you can view and control a credit balance and history as well as apply a store credit to a purchase. Buyers also get various management features in a customer account. As for import/export of store credits and all the related data, it is possible only with the Improved Import & Export Magento 2 extension. Our module adds the missing functionality allowing you to import and export Magento 2 Commerce store credit data in just a few clicks. Follow the link above for further information. Now, you know how to improve the default functionality of Commerce and Cloud editions. For further features specific for both versions, follow this link: Magento 2 Commerce and Cloud (Enterprise Edition) Specific Features. And don’t miss the latest Magento 2.3 Open Source & Commerce Features and Release Notes.